I'm actually making some progress on my modern barn quilt for this year's paint along. How are all of yours coming? I'm a bit behind because I was under the weather last week with a cold, but I've got my board primed and ready to go. And I finally came up with the design. I'm going with an Ohio Star block, which has been on my mind the past few months with my Ohio Supernova quilt and our CMQG exhibition at the International Quilt Festival. 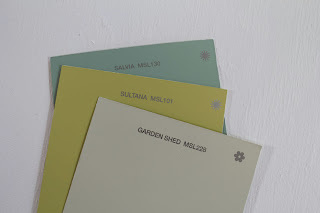 But instead of the coral, sea foam, and cream that I used in my quilt, I'm using these three colors from the Martha Stewart line of paint at Home Depot. 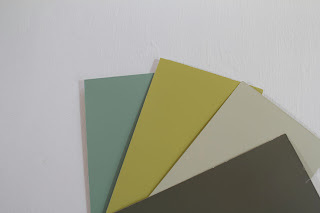 We're actually in the process of painting our house, and we're using these three colors (plus a fourth), so I thought they'd be perfect for the Ohio Star barn quilt. The colors, from top to bottom, are Salvia, Sultana, and Garden Shed. Don't you just love the names of paint colors? 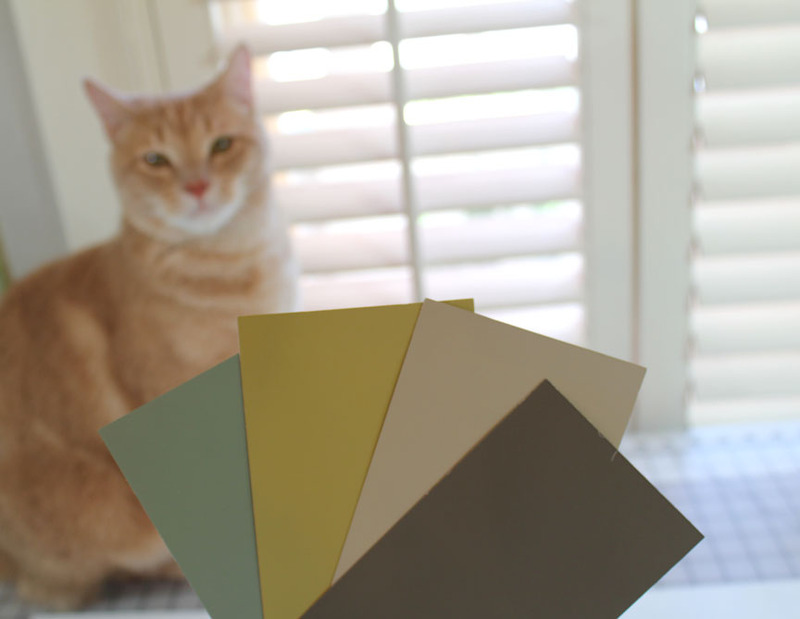 I think my little helper agrees on the color choice as well. And here's a couple of tips if you choose to use paints from Martha's line at Home Depot: while I think she has an amazingly gorgeous array of colors to choose from, I prefer Home Depot's Behr brand paint, so I always have Martha's hues color-matched into Behr paint bases. I especially love the Behr Premium Plus Ultra, which has primer mixed in with the paint. 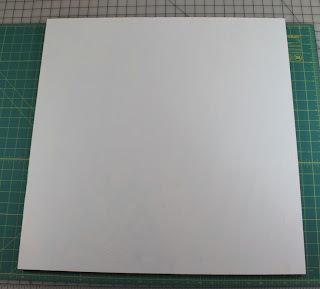 Also, I'm using exterior paint for my barn quilt (since we're already using those colors in our house painting project), but you can use either interior or exterior paint (and even acrylic craft paint) because you'll be finishing the barn quilt with a few coats of polyurethane sealer. I can't wait to get this barn quilt finished, and I can't wait to see yours! If you're painting along, please let me know and send me photos of your finished barn quilts, and even your quilts in process. Also, feel free to add them to the Modern Barn Quilt Paint Along pool on flickr! I've got my supplies. 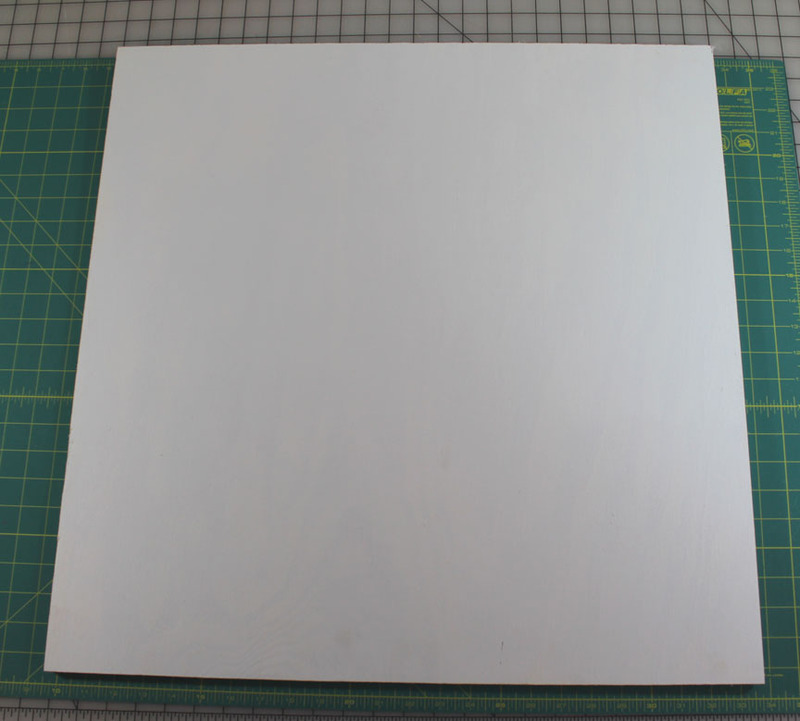 Just need hubby to cut my board, then I can prime. I found a cool star block to use. Debating between that and a modified North Carolina Star. It' going to be gift (putting house numbers over the top of it). The colors you have chosen are also good for office painting. I hope that it will turn out good on your house walls too. Make sure it will complement your furniture.